Mummy's Space: Join the #GiantGazillionBubbles Twitter Frenzy! Join the #GiantGazillionBubbles Twitter Frenzy! We love Gazillion Bubbles, they are so much fun and make the awesomest bubbles ever. We have both the Gazillion Bubble Tornado Machine and the Gazillion Incredibubble Wand which get taken out every time the weather turns nice and we hit the garden. I don't think you ever grow out of the magic of bubbles and watching the kids run about trying to pop them, hearing the laughs and squeals of delight is something I will never tire of. 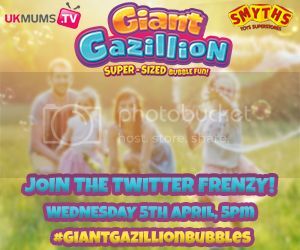 If you are as excited as us about Gazillion Bubbles join @mmeeee on Twitter along with UKMumsTV on Wednesday 5th April at 5pm for the Gazillion Bubbles Twitter Frenzy and use the hashtag #GiantGazillionBubbles to get involved. For 90 minutes you will have chances to win great Gazillion prizes and have some bubble-tastic fun too! Check out UKMumsTV for more information. See you then!